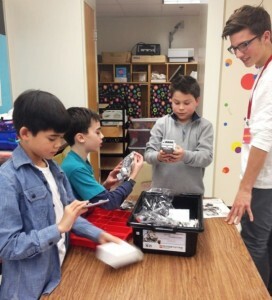 Fourth graders – Devon Welch, Noah Santangelo and Ben Rector – work with Luke DeFrino of Chester, a junior at Valley Regional High School, during a new Lego robotics program at EES. ESSEX — A special after-school program recently began at Essex Elementary School (EES). Boys and girls, in grades 4 through 6, are learning about engineering concepts by building Lego Mindstorms robots. Jimmy Christensen, a science teacher from Bushy Hill Outdoor Education and Leadership Center, is working with students each week, alongside a team of high school mentors. This program is sponsored by the Essex Elementary School Foundation, a not-for-profit, volunteer organization that provides funds for enrichment opportunities, such as author visits and an iPad lab. For donation information, head to www.essexelementaryschoolfoundation.org.